Ai Yamaguchi is an artist who utilises a unique combination of delicately drawn lines and celluloid picture-like expression to vividly portray the lives of young female prostitutes. Her works conjure up a sense of curiosity and amazement within the viewer, due to the depiction of young girls from multiple angles and in a wide variety of poses. As a result, they powerfully embody the sexuality typical of the Edo period, combined with a peculiar brand of eroticism unique to the artist’s hand. Yamaguchi’s style has also been said to combine “flatness,” regarded as a particularly characteristic feature of traditional Japanese art, with trends in Japanese subculture. This means that the patterns found in Yamaguchi’s paintings are often directly influenced by anime and manga, which imbues her works with a strong sense of the contemporary. Despite having grown up in a generation obsessed with the manga subculture, which shows in her works, it might be more accurate to note that Yamaguchi’s works are also infused with a rare sensitivity to works from the Edo art period. In an effort to show how she blends the two worlds, Yamaguchi also freely makes use of kana and kanji words that personally capture her thoughts and ideas well, ancient Japanese vocabulary or self-coined words in titling her works, making them seem more abstract and impressionistic. 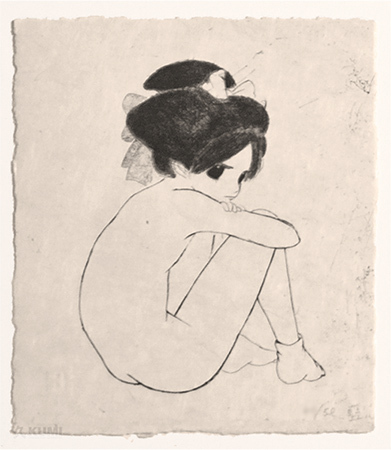 It is through these techniques that Yamaguchi conveys a strong sense of self-expression, by depicting these young girls in her works and using them as a filter through which she can achieve a strange equilibrium with the world. Apart from that, the viewer will once again become aware of the fact that this artwork, substantiated by a high degree of perfection, carries a strong intensity that only she can achieve.